The Britline International Payments Service is powered by international payments experts HiFX Europe Limited. 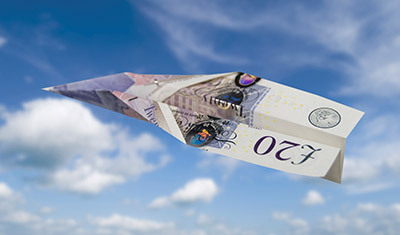 You may wish to transfer funds from your UK bank account to Britline in sterling. To arrange this you will need to contact your UK bank and provide them with your IBAN and SWIFT codes. These can be found on your cheque book or at the bottom of your bank statement. A flat rate handling fee, no matter how much you are sending (please refer to our Principal banking fees). To avoid delays in crediting your account, please note that all cheques should be posted directly to CA Britline. Please remember that you need to sign cheques on the reverse and quote your account number to avoid a delay in crediting them to your account. When paying in a € cheque drawn on a French bank, please use a paying-in slip. These can be found at the front of your chequebook, or you can request a paying in book by contacting CA Britline. Please remember that you need to sign cheques on the reverse and quote your account number to avoid a delay in crediting them to your account. If crediting a € account, the funds will be automatically converted into €’s using our commercial exchange rate on the day we receive your cheque. If crediting a Britline Sterling account the funds will remain in Sterling. For details on handling fees please refer to our Principal banking fees. When in France you may wish to credit your Britline account by paying cash in at a local branch of Crédit Agricole. As with many banks in France, Crédit Agricole is a regionalised bank. This means that branches outside Normandy, where your Britline account is held, will not have access to your account. If you choose to deposit cash and are not in Normandy, this transaction is referred to as a versement déplacé. Be aware that due to regional policy, some branches may refuse to take a cash deposit for an account held in another region. You will therefore need to check with the local branch if they accept cash deposits from out of region account holders. To avoid delays when you make a "versement déplacé", it is very important that you include a copy of your RIB and passport. For more information on RIBs, see the Print your RIB section.